This manuscript is being processed. This is the Canadian paperback edition of The First Eagle published by HarperCollins in Toronto in 1998. 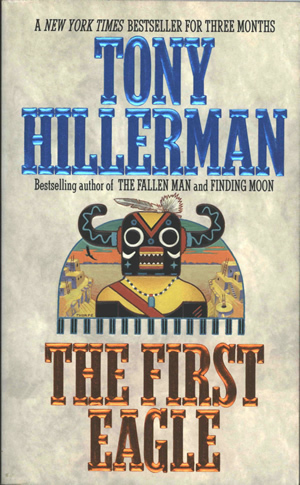 The cover is very similar to the first edition hardcover and features an illustration by Peter Thorpe of a kachina masked figure, which somewhat resembles Ahote kachina, standing in front of a half moon shaped frame containing a Pueblo cliff village and an eagle swooping through a southwestern sunset. The author's name is printed in raised metallic blue type, and the book title in raised metallic red type. The back cover displays a narrow paragraph of text describing the content of the novel, flanked by two elongated Yei figures. The inside back cover features Tony Hillerman's photo and biography. Binding: Full-color paper covers. The author's name and book title are printed in raised metallic type on the spine.